WASHINGTON— In response to the efforts of conservation and wildlife protection groups, the National Marine Fisheries Service today proposed to protect 39,655 square miles as critical habitat for North Atlantic right whales. Only about 450 of the critically endangered whales exist today, and without additional protections the species faces a serious risk of extinction. Photo courtesy NOAA. This photo is available for media use. The Fisheries Service’s proposed rule would protect crucial habitat for right whales, including northeast feeding areas in the Gulf of Maine/Georges Bank region and calving grounds from southern North Carolina to northern Florida. However, the proposal entirely ignores the species’ twice-yearly migratory routes through the mid-Atlantic. The proposed rule responds to a September 2009 petition filed by the Center for Biological Diversity, Defenders of Wildlife, The Humane Society of the United States, and Whale and Dolphin Conservation. Issuance of the proposed rule was also compelled by a settlement agreement resolving litigation over the agency’s delay in taking action on the petition. “Right whales are at an extinction crossroads right now — offshore oil drilling, military sonar and commercial shipping on the Atlantic pose a serious risk to their survival. Protecting critical habitat between calving and foraging areas will be essential to saving these majestic whales,” said Miyoko Sakashita, oceans director at the Center for Biological Diversity. For several years the Fisheries Service has acknowledged that expanding habitat protections is vital to reflect the most up-to-date information on the North Atlantic right whales’ seasonal habitat use and to help address longstanding threats to the species, including death and serious injury resulting from ship strikes and entanglement in commercial fishing gear. 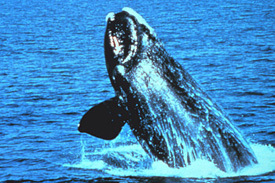 Further, right whales increasingly face emerging threats from offshore energy development. Designating critical habitat under the Endangered Species Act requires the federal government to ensure adequate protected habitat so that human activities won’t degrade the value of the species’ environment or reduce its chances for recovery. The groups’ 2009 petition sought to expand critical habitat protections to all of the right whale’s nursery, breeding and feeding grounds along the East Coast and requested an increase in the whale’s protected area more than tenfold, to more than 50,000 square miles.